The Lasso and Marquee options let you choose the type of selection the current tool will perform. The default selection mode is Marquee. • Lasso lets you draw a custom selection box around zones. 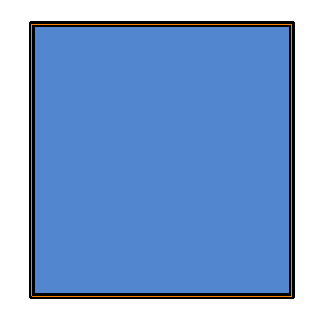 • Marquee makes a rectangle selection box. Hold down the Alt key to switch to toggle between the selection modes. You can also find these tools directly in the Tools toolbar and in the Drawing Tools menu. The Paint mode paints everything it touches, including empty and filled zones—see Painting Using the Paint Tool. The Repaint mode paints everything it touches except empty zones. Any zone that is not painted will remain intact. 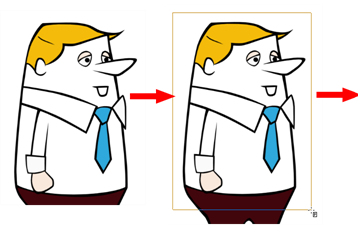 The Paint and Remove Texture option is used when you vectorized images as greyscale texture style. 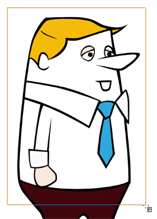 An image vectorized as texture is a mix of bitmap filling encapsulated in a vector-based frame. Painting a textured zones with the Paint tool will change the tint of the textured lines. Painting the textured zones using the Paint and Remove Texture option transforms the bitmap filling into a 100% vector based zone and fills it with a solid colour. 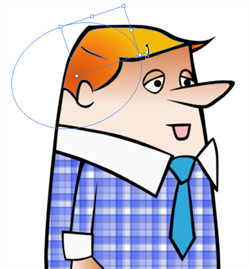 The Apply to Multiple Drawings option is used for fast painting in hand-drawn animation. 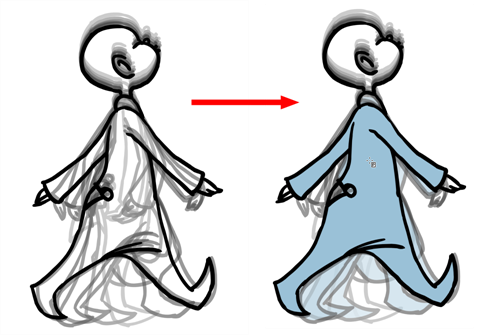 When you want to paint several drawings in a same layer at once, such as a walk cycle, you can enable this option and make a selection in the Drawing view. All the closed zones located within your Paint tool selection are painted with the selected colour swatch. 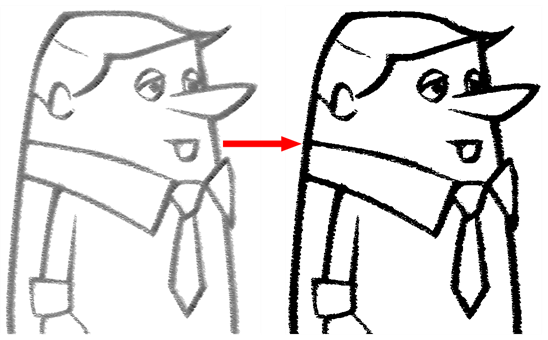 The Apply to All Visible Drawings option is used to paint several drawings on separated layers on the current frames. 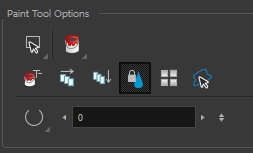 If you have a character broken in several layers, you can enable this option to paint all your layers at once. The operation is only applied on the current frame. This option will stay enabled only for the next action. If you want to use it again, you must click on the Apply to All Visible Drawings button again. NOTE: This option is only available in the Camera view and does not affect symbols. The Respect Protected Colour option is enabled by default. In your Colour view, you can protect some colour swatches to avoid repainting or unpainting the zones linked to that swatch. If you disable this option the Paint tool will not follow the protect colour rule and will repaint or unpaint the protected colours on your drawings until you enable the option again—see Protecting Colours. When you paint a zone with a gradient or textured colour swatch, the gradient or texture’s position is set relative to the size of the zone you are painting. If you want the Paint tool to use a particular size and position, you must first store your desired position and size using the Select tool and then enable the Use Stored Colour Gradient option in the Paint tool properties—see Editing Gradients and Textures . 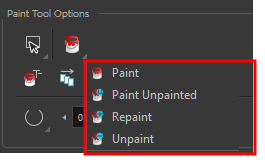 In the Paint tool properties, this option keeps a selection highlighted around the latest painted zone after using the Paint, Repaint, Unpaint, or Paint Unpainted tool. When painting, you may notice that some drawing areas are not closed. 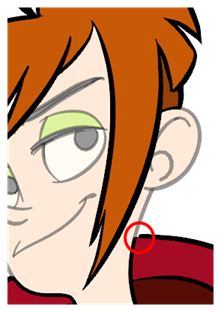 To close the zone, you can draw the missing line with the Brush or Pencil tool, or close the gap with an invisible line using the Close Gap tool. 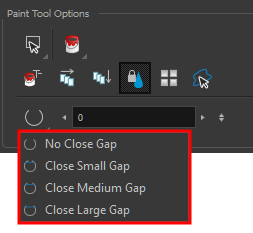 The Close Gap tool lets you close small gaps in a drawing by creating small, invisible strokes between the two closest points to close the colour zone. You do not need to trace directly over the gap. You can draw it a few millimeters away. The two closest points automatically close the gap. For more information, see Closing Gaps.